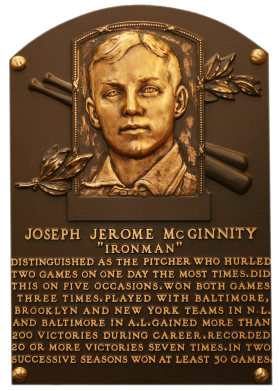 While Joe McGinnity's nickname "Iron Man" was derived from his off-season occupation in a foundry, it well described his mound efforts. For nine straight years he pitched 300-plus innings, topping 400 twice and leading the league five times. He had a career 247-144 record with a 2.64 ERA and 314 complete games. He pitched another 17 seasons in the minors, finally retiring at age 54. Comments: I started with a tribute card for McGinnity, acquiring a 1961 Fleer PSA 8 in June, 2001 via eBay. In October, 2003 I picked up a card contemporary to his career - a raw Fan Craze issue in pretty rough shape. I upgraded to a PSA 5 with another eBay win in January, 2005. And, another upgrade to a PSA 8 in March, 2005 after winning an eBay auction from seller R. Dolloff. Since I already had Elmer Flick representing the Fan Craze issue I swapped the McGinnity out for a new type card - going with a 1912 C46 SGC 10 in January, 2006. That didn't last long as I settled on Joseph Kelley for C46. In December, 2007 I made another change, buying this PSA 8 Colgan's Chips card from seller Kris Keppler via eBay. 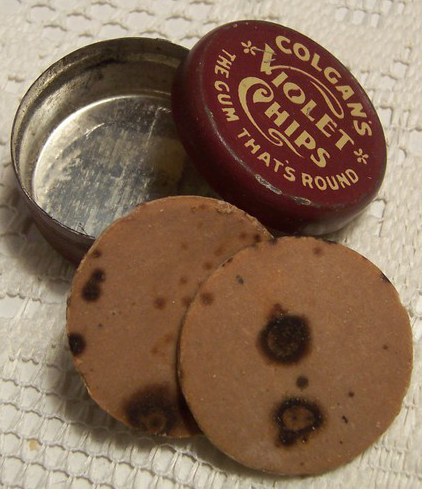 Description: This unusual set of 1-1/2" diameter round cards was issued over a three-year period (1909-11) by the Colgan Gum Co., Louisville, KY. the cards were inserted in five-cent tins of Colgan's Mint Chips and Violet Chips brands of gum. The borderless cards feature a black-and-white player portrait on the front along with the player's last name, team and league. 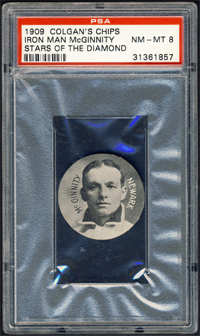 On more than a dozen cards variations are known in the size of the photo and/or lettering on the front. 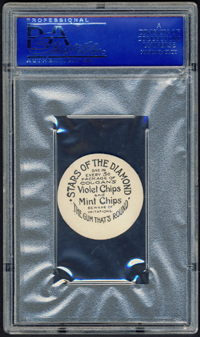 The card back identifies the set as "Stars of the Diamond" and carries advertising for Colgan's Gum. Over 230 different players were pictured over the three-year period, but because to team changes and other notable variations, more than 300 different cards exist.